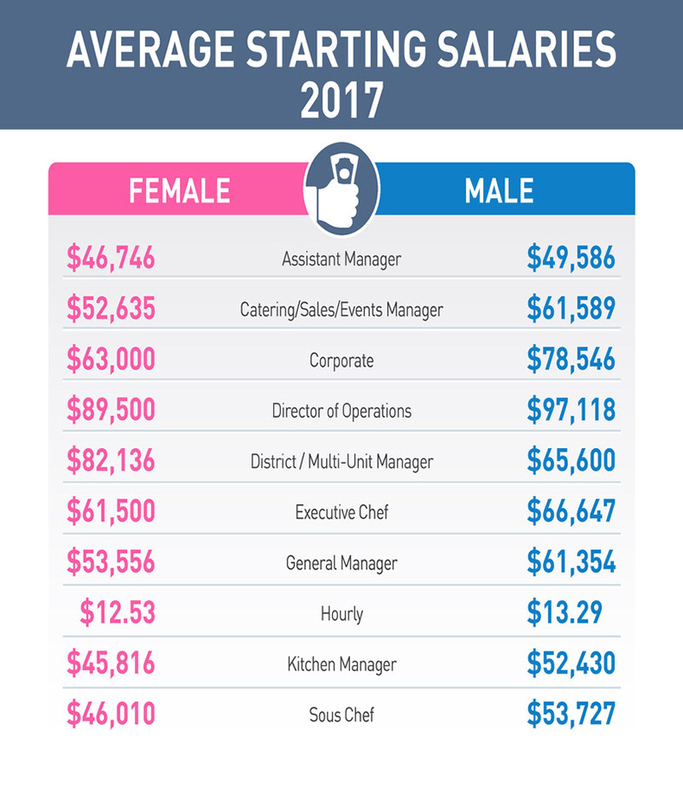 Men got paid considerably more than women in the hospitality industry in 2017, according to the annual Restaurant Management Salary Survey Report released by Gecko Hospitality on Wednesday. The report, which is in its third year, includes survey results from 2,089 restaurant management professionals, collected by Gecko Hospitality between January and December 2017. Fort Myers, Fla.-based Gecko is a national hospitality recruitment company. Of those surveyed, 601 were female and 1488 were male. Across all positions, men earned an average of $4,728 per year more than women. The survey results showed a consistent gender-based pay gap among starting salaries for all measured categories, except one: the district or multi-unit manager. For an assistant manager position, for example, women started at $46,746 on average, while men earned $49,586. Female directors of operations started at about $89,500 while their male counterparts starting salary was $97,118. The average starting salary for female corporate executives was $63,000, compared with $78,546 for men. Among hourly workers, women started at $12.53 per hour and men started at $13.29. Women, however, earned more in average starting salary as district or multi-unit-level managers, according to the survey. Female district managers earned $82,136 compared with $65,600 for men. The anomaly was not explained. The report also noted that women tend to make up the majority of catering, sales and event-manager positions, while men were the majority of executive chef, sous chef, kitchen manager and general manager. One ray of hope for women, however: Of managers who accepted a management position with a new company, 37 percent of women received a salary increase, compared with 31 percent of men, which indicates a rush to hire female talent, the report said. The report also broke down salary trends by industry segment and region, indicating that women are taking the lead in some areas. Within the fast-casual segment, for example, female corporate executives had an average starting salary of $100,000 last year, compared to $72,000 for males in the same position. In the South, women also started at higher salaries than men in the family-dining segment specifically, where the average across all positions was $49,773 for women and $47,557 for men. The report, however, does not comment on the pay disparities, but serves as information employers and job seekers can use to find the right respective match.